Kurt Fleckenstein introduces Games Go On, his newest work in the context of his artistic practice. 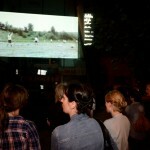 The video was screened on the WRO Art Center’s façade and was presented simultaneously in Wrocław, Kiev and Berlin during the UEFA Euro 2012 championship. Fleckenstein staged a football match at one of Kiev’s pitches with neither supporters nor media attending. His footballers play in historic outfits of the German 1941 representation with much enthusiasm and eagerness yet without clear rules applied. Instead of their own names on the trickots, they hold names and dates of places where 20th and 21st century mass murders were commited. If art would be only decorative it wouldn't be enought. Art has to be disturbing and stimulating, art has to motivate. Amongst them are naked people – men and women of different age – passing a ball between themselves. Every now and then, one of the naked persons falls down viciously fouled by the German players. 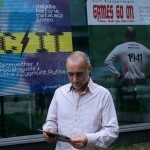 The work commemorates events of 1941 when Nazi Germans mass executed over 33.000 Jews in Babi Yar near Kiev, its title referes to the Munich massacre of 1972 when during the Olimpic Games Israeli athletes and coaches were murdered and the International Olympic Committee declared that “the Games must go on”. Fleckenstein combines the memory of past events with the present context, juxtaposing the idea of sport competition, and fair play rules with still ongoing genocides, national and ethic hatred and political power play.